When colour printing was introduced around 1835, it was quite a crude process, with only minor distinctions possible between colours. The technology improved greatly in the second half of the century, and with the invention of chromolithography coloured images could suddenly be mass produced quite inexpensively. 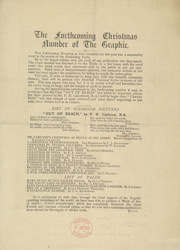 This advertisement for a Christmas edition of 'The Graphic' makes a point of noting coloured illustrations in the paper - evidence that it was considered a novelty to print or even own such images even as late as 1881.